The Dollywood Dreammore Resort has been in the works for several years now, and now the dream has become a reality! The most amazing thing about this resort is it's dedication! The building, and the land it sits on has been dedicated to God! The ceremony was beautiful. An authentic Cherokee Indian led the service. Dolly spoke beautiful words of praise, and all in attendance bowed in prayer. This resort offers several places of relaxation including family rooms, rocking chairs, swimming pools, and more. Dolly does have a private room here for herself! Ummm...ya think she might be willing to rent this room when she's out of town???!!! It's just part of experiencing Dolly Parton Home! Dollywood has more than 40 rides and attractions! It's the place where the Wild Eagle, America's first winged roller coaster resides. It's where you see amazing shows, experience adventure, meet Dolly, laugh out loud, and create lasting family vacation memories! Dollywood is the place you feel your spirit soar with Southern gospel music. It's learning about Christian music, worshiping God on Sundays, and celebrating the birth of Jesus at Christmas. Dollywood is fireworks, and video games! It's learning about our southern heritage, experiencing old things new, and watching real craftsman at work. It's wholesome country cooking, junk food, going to the carnival, and riding the train. It's a Festival of Nations, It's good barbecue and live bluegrass music. It's the place Dolly always comes back to! Dollywood is just another Dolly Parton Home!! 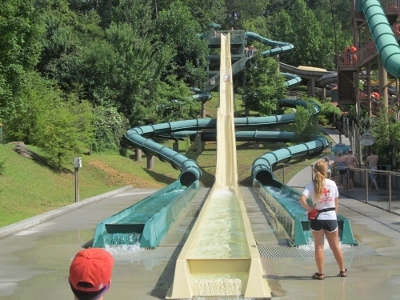 Dollywood's Splash Country is not your typical water park! It's nestled inside the exciting city of Pigeon Forge, TN and houses some of the best water rides the world has ever seen! A full 35 acres of play areas and splashing fun. Relax by floating down the 1,500 lazy river, or move with the speed of light down dare-devil waterslides that end with a huge plunge into a cool, refreshing pool. It's where you ride Tennessee's first water coaster - River Rush. It's the place where we all turn into kids! It's where you plan private retreats, enjoy great shopping, eat delicious foods, and yummy snacks. It's where Dolly has made public appearances, and experienced fear of getting wet. It's where she has gathered in front of crowds, made funny comments, and introduced the opening of her new hotel. It's nestled inside the beautiful Smoky Mountain valley and once again known as Dolly Parton Home!! The Dolly Parton Stampede is one of the highest rated dinner theaters in the Smokies! It's a diverse mix of talent that will amaze every member of the family. The Dixie Stampede is about live animals, circus tricks, horseback riding, friendly competition, singing, dancing, eating, and a lots of laughter! The Dolly Parton Stampede is about the old west, southern belles, the spirit of America, southern hospitality, and country cooking. The Dolly Parton Stampede is where Dolly is displayed on video talking and singing as the riders perform heartwarming scenes. It's a place she would recognize anywhere because it's something special she has chosen to become part of inside her Smoky Mountain home. The Dollywood Foundation is an organization we don't hear about nearly enough! It's an organization Dolly started in 1996 to help the folks she cares about most - the folks at home! The Dollywood Foundation is the organization Dolly works through to do all the amazing things she does for her Smoky Mountain community. It's about using funds to encourage high school children to graduate! It's about becoming Dolly becoming the "book lady" for her Imagination Library that distributes children's books born and raised in Sevier County. The Dollywood Foundation is about some of the most wonderful Dolly concerts I've ever experienced with all proceeds going to the foundation to help those in the area! It's about loving children, and reaching out to others when they need it most. It's the "heartsong" of Dolly Parton! I don't have any information about Dolly Parton's houses. I don't know how many she has, where they are, or who lives with her. Somehow it just doesn't seem that important. However, I do know where she keeps the home fires burning! Sevier County is a place where the door is always open and YOU are always welcome! It's just outside the gateway to the Great Smoky Mountains and truly, it has become known as.......Dolly Parton Home!